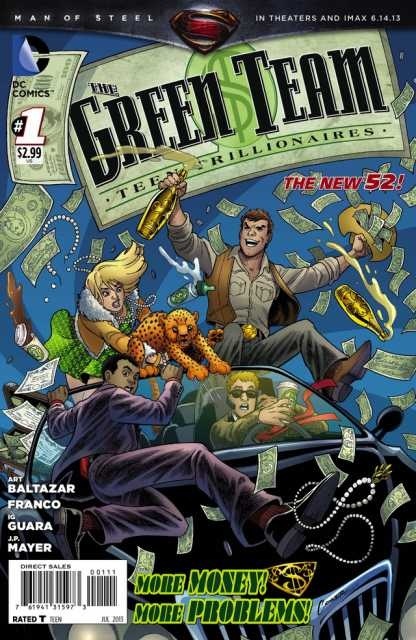 When I learned that Art Baltazar and Franco would be writing this series, I knew right away I had to support The Green Team, a New 52 title by DC Comics. Or at least the first issue. The title alone gives you an idea of the main characters, wealthy teenagers. The Green Team is a development company led and funded by the wealthy tech guru, Commodore Murphy. Given only a short timeframe to prepare, exhibitors are invited to Poxpo, or Pop-Up Expo at a secret location. Guests are invited as well, but with a two-day notice. The exhibitors are given the chance to show off their inventions to Commodore, in hopes that he funds their developments. But we soon learn Commodore’s ulterior motive behind the Poxpos. This story is a light read, but may appeal more to teens/young adults. I knew the script would be well-written and easy to follow because of Baltazar and Franco’s run on Tiny Titans and Superman Family Adventures (two popular but canceled DC titles that my kids loved). Although the set-up for the story is great, unless my tween wants to read the series I may not continue reading this title. I have no complaints about the story at all. It just does not fit my personal taste. I may read the next issue to see where it’s heading. I have to admit that I am curious as to what’s going to happen to Commodore and the rest of the gang. I am especially interested in Commodore because he took a surprising turn towards the end of the story. Thus the adventures begin. The art team consists of IG Guara (pencils), J.P. Mayer (inker), and Wil Quintana (colorist). Great visual storytellers. I have no complaints in this area. I highly recommend Green Team for teens and young adults. I recommend it for older readers looking for a light, but adventuresome read.